In October 1964, Bing Crosby Productions and Pendick Enterprises, actor Richard Crenna’s production company, struck a deal with ABC to produce a pilot for a half-hour situation comedy, tentatively titled Baby Makes Three, based on a 1963 short story by Harriet Frank Jr. On October 6, 1964, BCP president Basil Grillo told Variety they had cast Joan Blondell in the series and were hunting for a lead actor. On November 24, Crenna’s BCP series Slattery’s People began a three-week hiatus so its crew could film the Baby Makes Three pilot at Desilu Gower Studios, with Crenna producing and directing from a script by Jack Marlowe and Bill O’Hallaren. James Stacy played young pediatrician Peter Martin Cooper, who sets up his first practice at the Northberry Medical Center, hiring Joan Terry (Blondell) as his nurse. The other series regulars were Lynn Loring as Jenny Winton (Cooper’s girlfriend, a student nurse employed at a nearby hospital) and Gavin McLeod in the “wacky neighbor” role as dentist Charles Norwood. 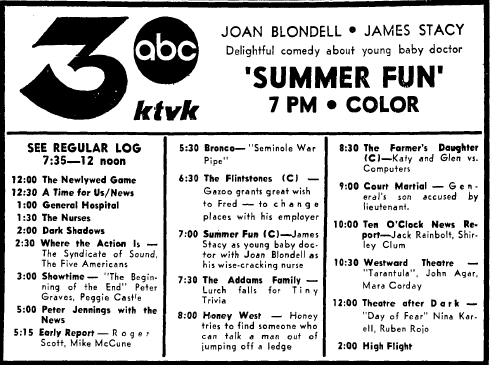 ABC failed to pick up the show — ultimately produced as And Baby Makes Three and at one point retitled Baby Crazy — but did air the pilot at 8:00 p.m. Eastern and Pacific on Friday, August 19, 1966, as part of Summer Fun, an anthology series devoted to busted sitcom pilots. 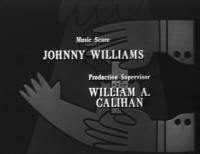 Williams recorded a 40-second version his playful And Baby Makes Three theme (which incorporates “Rock-a-bye Baby”) for the show’s opening credits and a 35-second version for the end titles. His background music for the pilot, totalling just under eight minutes, involves mostly brief cues, many of which include variations of the And Baby Makes Three theme, with one act-in based on “Rock-a-bye Baby.” A romantic theme for the relationship between Peter and Jenny dominates the two longest cues (one running 105 seconds, the second clocking in at 60 seconds). No music from And Baby Makes Three has ever been released. The pilot episode of And Baby Makes Three has never been released in any format. “And Baby Makes Three,” Harriet Frank Jr.